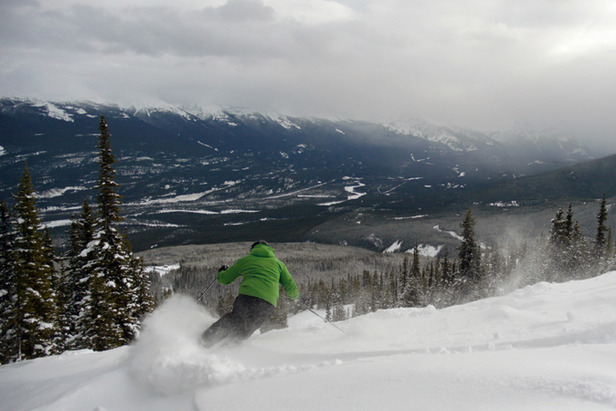 A skier rides down Marmot Basin in fresh snow. Photo courtesy of Marmot Basin. With over three months left to go in the ski season, Marmot Basin near Jasper has already received over 12 feet (372 cm) of snowfall which is 93% of its annual average. If the next three months produce typical amounts of snowfall, Marmot Basin will exceed its all time snowfall record of 529 cm set way back in 1965. Regardless of the numbers, skiers and snowboarders have been absolutely thrilled with snow conditions at Marmot Basin and, to some, it has come as a bit of a surprise. "There is very little snow on the ground in one of our closest big cities Edmonton and when some people get to the mountain they are really surprised at how much snow we have" says Brian Rode, Marmot's VP of marketing. "Marmot's base elevation is very high so the rain that has fallen at lower elevations this winter has been all snow at Marmot", added Rode. Marmot Basin skiers and boarders are not only basking in exceptional snow conditions, they also have two new chairlifts to ride this winter including the new Paradise high speed quad chair. Marmot Basin has installed three new chairlifts in as many years and is leading all Canadian ski areas in ski lift development. "Marmot Basin is not the same ski area it was three years ago. The three new chairlifts we have installed, along with all our other improvements, has really transformed the ski experience at Marmot", comments Rode. "I've talked to people who have come back to Marmot after a few years away and they are blown away by how different and how much better the mountain is", he adds. Marmot Basin will be open until May 6th this season thanks in part to all the snow Mother Nature has bestowed upon the area and also thanks to the state-of-the-art snowmaking system that was installed in 2006.